"Alien vs Predator is a video game developed by Rebellion and published by Atari Corporation for the Atari Jaguar console in 1994. Based on the Alien vs. Predator franchise, the game allows the player to play as one of three characters: an Alien, a Predator, or human Private Lance Lewis of the Colonial Marines." 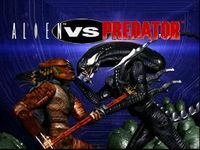 Source: Wikipedia, "Alien vs Predator (Jaguar game)," available under the CC-BY-SA License.